I really like Mocha Rouge, and Safari Sunset. I cant decide so many beautiful colors coming out..Thanks for the great pictures and the first showing. Love your Blog!! now i know why they're retiring purple punch! i'm not a purple person but plum petals is very cute! i'm a pink person so i think mocha rouge is really cute... man they need to go out of business and STOP making such cute things... i'm going broke!!!! UGH! I love Happy Snails and Safari Sunset!!! Mocha Rouge reminds me of Mod Floral Pink, very similar to me. 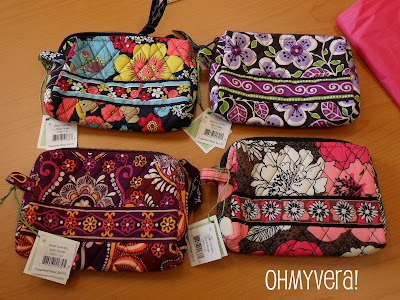 Thank you for sharing :-) I work at a store that sells Vera and I am in charge of that department and ordering so I like to get a leg up on new new patterns! Plum Petals and Happy Snails will both be on my buy list! I really like Plum Petals and Mocha Rouge, I'll have to call my VB store and see if they're doing a preview. My MIL is going to go over and pick me up one of the card keepers since I can't get over until the promotion is almost over. I was hoping for more fall colors. Orange, Browns, Reds and Grays. These seem more like spring/summer. They are very cute. But I wouldnt wear a that much bright color in the fall. Maybe only for travel bags! I think all of these are going to have to grow on me. I don't really have a favorite of any of them. Do you have photos of the inside patterns? I dont have pictures of the insides, sorry. I am loving these more than the Summer colors, which is good because then it will give me sometime to save up some cash! All purple prints for Fall. And Happy Snails? What were they thinking? No wonder so many are no longer buying Vera. Give me a nicely made leather bag any day over this. I've got tons of photos if you'd like to use them, inside lining too! :D Happy to share with Veraddicts! How can I find out what stores have a fall preview sale?!?!?!?!?!?! LOVE LOVE LOVE Safari Sunset. It has the coolest cross pattern lining in a burnt orange. So perfect for fall. I bought a piece in it at the preview sale in Southlake TX!! All the patterns are very nice in person. It's been a VERY long time since I've liked all the patterns on a release. Good job VB!! OMG! So excited about these beautiful fall prints! Although in the bad weather months I tend to wear a leather handbag, these will work for fall! I love the navy based snails. Even though a lot of stores now sell "faux" VB bags, I think nothing compares to the real thing! Alison, please keep us updated on upcoming sales and special deals!!! Some very nice prints for the fall! I was lucky enough to see them in person today, at my Vera store. They are all very nice, but Safari Sunset is the best for me. I bought a mini hipster for my upcoming trip to Europe. It's beautiful! Just found your site! I am glad that there are other VB addicts like me! I LOVE all of these patterns!! I will have to get something from each one! Much better than the summer colors I think personally. But I did get something in Viva la Vera. Do you know when the fall patterns will be released?! 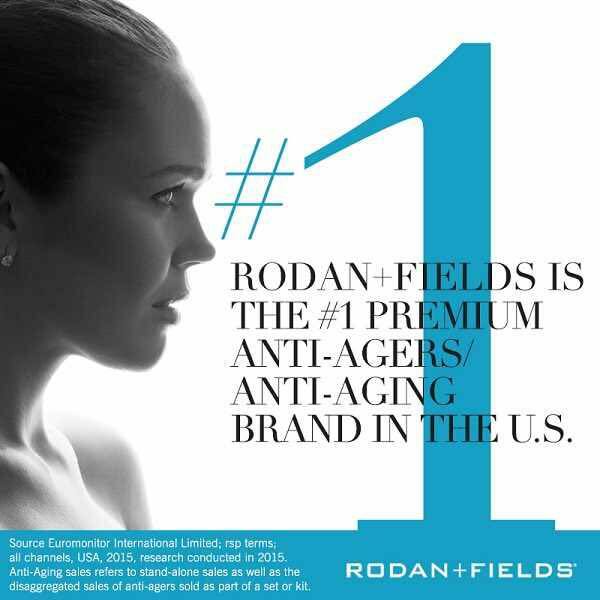 Love the sneak peeks - thanks! I think Plum Petals and Safari Sunset will be on my list. Finally - there's a VB purple pattern that looks worthy enough to me (based on the pictures, anyway). I found the previous purples too dark, combined with too many other colors, or too much brown background, etc. I agree with others - the blessing of VB patterns you love is balanced by the curse of using $ - and vice versa. Also, I keep waiting for another company to do the print bags thing (and with VB's great placement of pockets), but with more modern prints and not quilt material. Kind of like LeSportSac and Ju-Ju-Be, but more refined for grown women. Theirs look too much like "travel bags" and diaper bags, respectively. I agree with the girl above,you are insulting people who like the snails.I like them too.its a cute bag. Ohh yeah! I am soo very excited for Fall '11!Im for sure going to get Happy snails and Mocha rouge! Such good bags,Veras are!I get the backpacks because my boyfriend doesn't like me carrying purses.But Vera is always greattt! 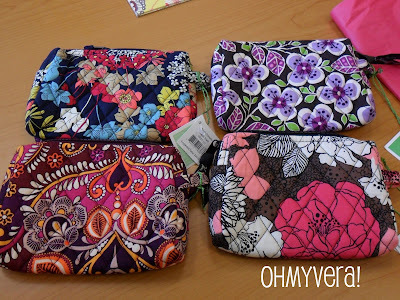 I <3 Vera Bradley!!! Is the Plum Petals background black? I really want VB to make a navy background bag that has either purple or dark colors as the focal points. Seems like when they do bring out a navy background-the colors are loud. I must say I am so glad I found this blog and all of you fellow VB Addicts. I just got my Deco Daisy Frill Tote and Criss Cross Wristlet! Sooooooo in LOVE! Also, one more question, any new collections or purse/accessories pictures floating around to share? Does anyone know the actual release date of the fall patterns ??? June ? I love the Safari Sunset and Mocha Rouge! I'm disapointed in all but the Plum Petals. Which is good. I own so much Vera Bradley now, no room for new. LOVE the new patterns!! I just want to fast forward to July 7th!!! I saw the new prints last week. Love the Mocha Rouge the best. It's funny how someone said it reminded them of Mod Floral Pink, because that is what they modeled it after, the saleslady said. I had loved that color too. HAPPY SNAILS IS SO CUTE THEY'RE OUT IN 2 DAYS , I ALSO LOVE MOCHA ROUGE!!! CAN'T WAIT TO BUY THEM!!! My alma mater's colors were maroon and orange, so I will be be buying tons of Safari Sunset and I'm guessing my ole college campus will be flooded with the print as well. So excited!!! I won the Happy Snails print at bingo. I didn't like it when i first saw it but now i am in love with it! Are they discontinuing the angled tote? it's not in the plum petals or any of the new fall colors. I love happy snails! I will have to buy something in that print!! I heard this pattern was designed from a real snail. Does anyone know the name of the snail? I simply ADORE Mocha Rouge. I have this print in the Go Round Tote and the Cooler. If you're looking for a lunchbox get the cooler in Mocha Rouge, SO PRETTY! I luv, luv, luv, luv Mocha Rouge. I am such a pink girl!